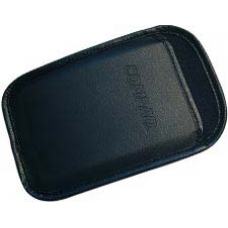 The official Compaq slip case is one the thinnest cases available for the iPAQ Pocket PC. This case was originally specified and supplied by Compaq with all new units. The case features a rigid insert to protect the screen, a quality black leatherette finish with COMPAQ embossed on the front. The case allows for full protection on the sides and bottom of the device.